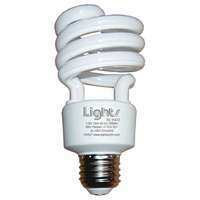 They save 75% or more in energy costs… last 10,000 hours… and fit where other CFLs won’t. Above you can see the bright white light of our Vi-Tek that gives you greater seeability and is just like the light you see when sitting outside on a nice day. On the the right is our Opti-Tek® wich creates a warmer tone without throwing a yellow cast. H&H’s Twistee® Compact Fluorescents start saving you money the minute you screw them into the socket. And they keep on saving money—and precious energy—throughout their long burning life! Twistees are commercial grade which means you are getting a superior light made with quality components. Just replace your wattage-hungry incandescent bulbs with a new Twistee CFLs, and you’ll slash your lighting power costs by 75%—while maintaining, or even increasing, your present light levels! At 10¢ per kWh, just one 20-watt Twistee® replacing a 75-watt incandescent will save $55 in energy costs over its 10,000-hour life. Savings are based on burning the 20-watt Twistee at 10¢ per kWh (20 watts X 10kWh X 10¢) versus the cost of operating a 75-watt incandescent for the same length of time. What’s more, you’ll use only one Twistee® for every 10-13 incandescents, saving greatly on labor and maintenance, and reducing the number of bulb-changing operations. Their small, compact size makes them a perfect fit in most A-19 applications. 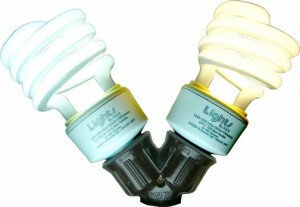 Twistee® is available in 13 and 20 watts and in two different Color Temperatures, however you use them, Twistee CFLs are backed by our one-year, “no-nonsense” Free-Replacement Warranty.